Written by Dezza, 10 April 2017. Are you looking for a weekend getaway close to Manila? Are you looking for somewhere that’s within driving distance from Manila? Well, keep on reading to learn more about one of the best places in the Philippines…. I have written on my destinations page about one of my absolute all-time favourite places in the Philippines, Maya Maya. There aren’t too many better places for a weekend getaway close to Manila. 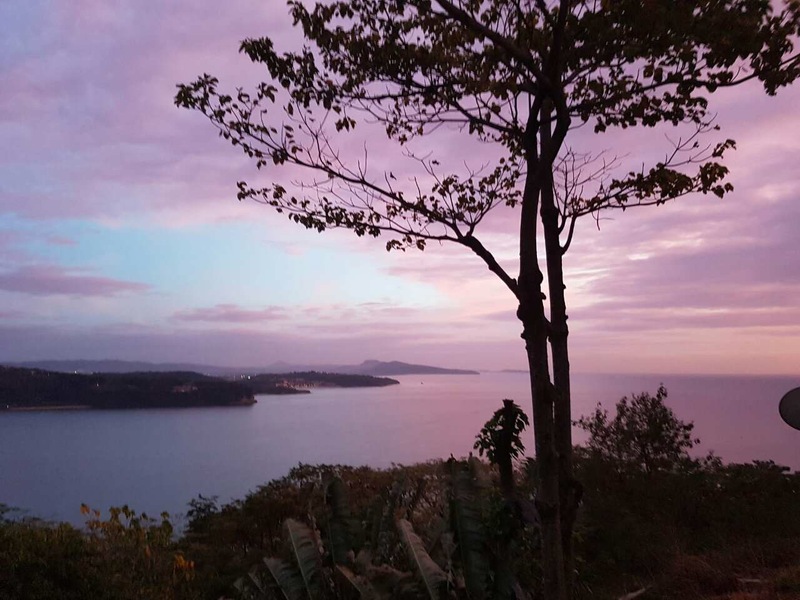 Located in the municipality of Nasugbu, Maya Maya is one of but dozens of sensational places that are dotted along the western coast of Batangas province south of Manila. I first went to Maya Maya in about 2008 on a research mission with my best mate, Brett, who was looking to buy a “weekender” within driving distance of Manila. A few mates of mine had weekenders in Maya Maya and had often talked about the great times they had down there boating, swimming, drinking and generally relaxing. I had been invited down there on a number of occasions but had never really got around to taking up the invites. So when Brett mentioned he was on the lookout for a weekend getaway close to Manila, Maya Maya immediately sprung to mind. One weekend, Brett and I decided to take a drive to check out the southern and western coast of Batangas. We wanted to try and get a feel for the place. To cut a long story short, we found out that one of my mates actually had a newly built house for sale in Maya Maya and after some negotiations, Brett eventually bought the place. Privacy and views were the key things for Brett were looking for, and this house offered it. Set right at the top a hill, the views are absolutely sensational. To make it even better, there is only one neighbour. Luckily, we know him well and what’s more, he is hardly ever there. Lack of privacy is certainly is not an issue. Enjoying a beer in the pool with the ocean in the background. It’s a tough life! One of the big plusses for Maya Maya is that it isn’t really geared up for traditional tourism– it is renowned more as a weekend getaway close to Manila. With private apartments and houses being more typical of the area, it doesn’t get overcrowded. 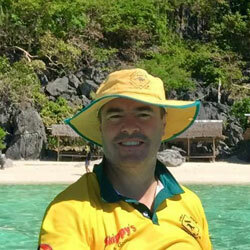 However, regardless of tourists, Brett’s place offers around the clock privacy and serenity. Brett’s place is basically a three, even a four-story house, as it is set on top of a very steep hill. It has the dining and kitchen area at the top, with three bedrooms below that. Then the next level down containers the pool deck area. However, you still get an amazing view of Nasugbu Bay and the South China Sea further to the west, even at pool level. 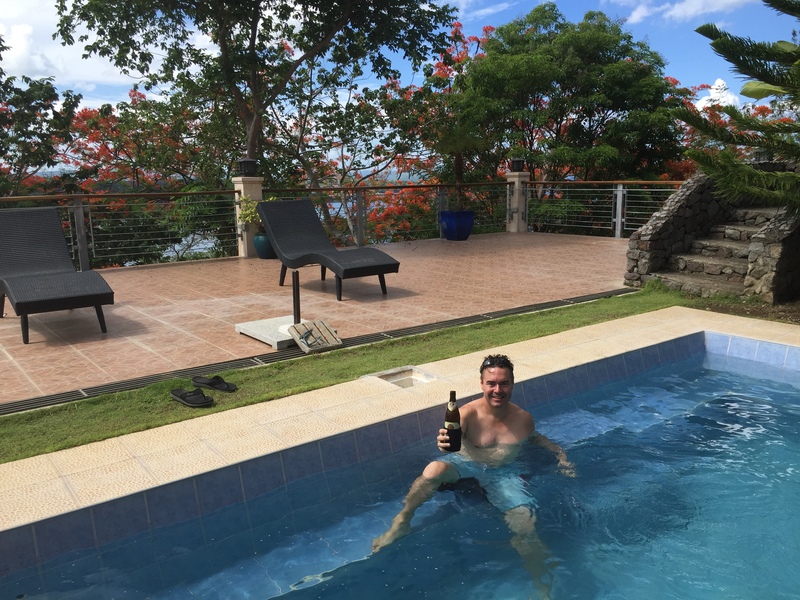 Although there are a few other resorts in the vicinity, most notably Club Punta Fuego, which consists of a yacht club, Terrazas De Punta Fuego and also the Maya Maya Yacht Club, you really don’t need to go anywhere further. The swimming pool has seats built around the edge of it. These are conveniently set about twelve inches below the top of the surface. 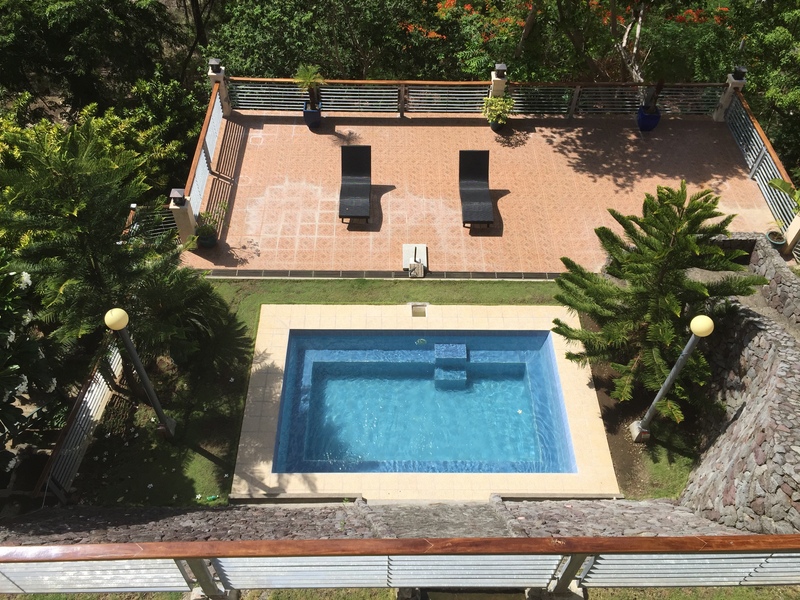 This allows you to sit in the pool, have a few drinks, and still soak up some sun rays. This is also great for kids. There is a nice pine tree next to the pool which offers some very welcome shade. With some BOSE speakers hooked up right next to the pool, you can also enjoy some music. The view down to the swimming pool shows just how steep the terrain is. It also shows the built-in seating. Brett also has a 20-foot centre console fishing boat which we take cruising out in Nasugbu Bay and beyond. Being located on the western coast of Luzon, Maya Maya and Nasugbu Bay are mostly protected from the bad weather with nearby Mt. Batulao, and the surrounding mountain range, providing welcome protection. Morning is usually the best time to go boating. The water is calmer at that time of the day, and the weather isn’t so hot. The best time of year for boating is February to May. This makes Easter the perfect time. There are some spectacular rock formations and caves along the surrounding coastline. There is the odd white sandy beach that can be found at Munting Buhangin (Terrazas De Punta Fuego), Tali Beach, Club Punta Fuego, Kawayan Cove and my favourite, Calayo. You can also go further north to Pico De Loro, or south down to Calatagan which can take a couple of hours by boat. Twin Islands and Fortune Islands are also places of interest. These are both off the coast of Nasugbu, which are accessible within an hour by boat. Calayo Beach is a sleepy little fishing village only a ten-minute drive from Maya Maya. Another one of the main features of Brett’s place is that he gets amazing views of the sunset. Although the house doesn’t actually face due west, that doesn’t matter. The view out across the bay with the sun setting is absolutely amazing. I have tried to get sick of it by looking at it on numerous occasions, but it’s impossible. The house has a massive balcony that stretches across the width of the house. This can comfortably accommodate 15-20 people. This leaves plenty of room to sit and relax while looking out across Nasugbu Bay. Amazing sunset views from the balcony. The other highlight of the house is that its only about a 20-minute drive from Nasugbu town centre. The town centre has everything there you need from a fish market selling beautiful fresh seafood, several fast food outlets including McDonalds and pharmacies right through to Savemore Supermarket. With the ability to be able to cook via a cooktop/stove and outdoor BBQ, you can stock right up and make yourself at home. Unfortunately, Brett doesn’t get much spare time these days. Therefore, he has recently made is house available through Air BnB so that others get to share the enjoyment his place has to offer. You can find out more about this sensational weekend getaway close to Manila or make a booking by clicking here. 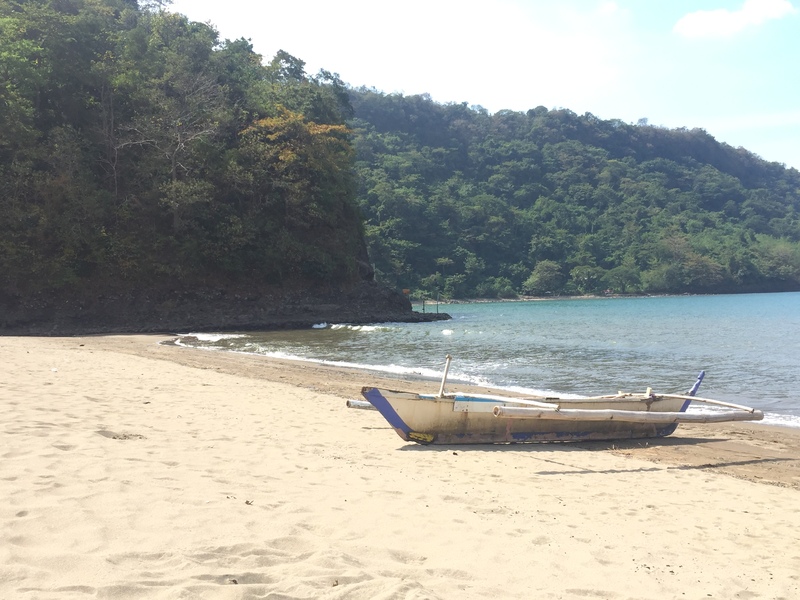 Maya Maya is located less than 90kms south of Makati and is approximately a 2.5-hour drive via the coastal road through Cavite, with the Ternate-Nasugbu Highway offering some great coastal scenery. Being only 100kms from Makati, it’s fairly easy to leave Manila on a Friday night, and then return to Manila Sunday night, giving you two full days to enjoy this hidden gem. Maya Maya can also be accessed via SLEX and via the Sta. Rosa exit through to Tagyatay. Once you reach Tagaytay-Calamba Rd, drive all the way through Tagaytay to Nasugbu until you hit the coast. Then drive north up and follow the signs for Maya Maya Yacht Club. If you have time, you can stopover in Tagyatay for a coffee or lunch and take in the views of Taal Volcano. However, this route can take over half an hour more (excluding a stopover). What can you do while you’re in Maya Maya? Check out the videos below which shows there are plenty of options to enjoy to make your stay all the more memorable.